Warren Buffett’s Annual Letter to Berkshire Hathaway Shareholders, and their annual shareholders meeting, are writ large on the calendar for investors. The same can be said for professionals who are in or researching – or in – the manufactured home industry. to a Clayton Homes front door at shareholders meeting. That was one of an ongoing string of acquisitions since then, which in more recent years have included purchases of site-builders, as well as other factory producers. annual Berkshire Hathaway shareholders meeting. 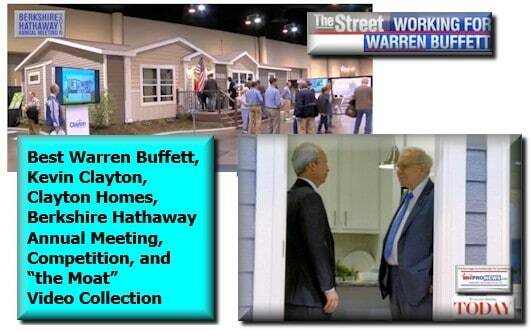 Why did Buffett do all this? Why has he endured the ‘drama’ that has gone along with Clayton Homes and manufactured housing? Pay close attention to what you see, hear and read, and you’ll get it. Short answer? Listen to Buffett explain his own principles. Mr. Buffett wants a business that is easy to understand. He wants a business with “a moat.” During an affordable housing crisis, what business is easier to understand than manufactured homes? Two quick quotes, and then on to the rest of the videos. “I call investing the greatest business in the world … because you never have to swing…All day you wait for the pitch you like; then when the fielders are asleep, you step up and hit it,” – Warren Buffett, per Wikiquotes. on military barracks, tiny houses more…Fox Business. insurance and other financial services arena. You’ll also get a peak into their move towards conventional housing, and they were already doing modular home construction. For those who are researching concerns over monopolies or alleged monopolistic practices – and how that had played out in manufactured housing – the videos below are must viewing. For those looking for a deeper dive in reading and research on related topics, the links below provide arguably the most comprehensive research by an informed, pro-industry expert and witness to the evolution of the industry from its early days as trailer houses, to the mobile home era, and to industry since June 15, 1976, when it formally became HUD Code regulated manufactured housing. The solution to the affordable housing crisis is hiding in plain sight. That’s been a subtext for closing in on a decade on MHProNews.com as well as on our public focused sister site, ManufacturedHomeLivingNews.com, both of which also looks at modular, prefab, conventional, and pre-HUD Code mobile homes. For first timers, to industry veterans, this is the number one site of its kind. Who says? Besides third party traffic data, there’s the widespread praise for these twin platforms that has flowed for years from many pros, including from the founder of Clayton Homes, Jim Clayton, as well as from independents and others. The video praised captured below is just a sampling of spoken and written praise. While we are pro-industry, we are also pro-consumer, and are strong believers in free enterprise. Unlike much of the trade media in our industry, we do not shy away from controversial topics. So, for example, the question of the impact of alleged monopolistic practices by Buffett, Berkshire and Clayton Homes, or other charges against the company are among topics we’ve closely examined for years. To provide a News Tips and/or Commentary, click this link. Please note if comments are on-or-off the record, thank you.